Ursula K. Le Guin was one of those authors that everyone seemed to have read except me. Still on that list are Stephen King and Michael Crichton – Neil Gaiman and Terry Pratchett are only saved by Good Omens. I was even more curious about her after watching “The Jane Austen Book Club” (talk about a movie better than the book! ), where Grigg is constantly recommending her as much more than your “average” fantasy writer. I also saw Ghibli’s Tales from Earthsea, which although far from being their best, is still visually stunning. So I decided to give Le Guin a try with the audiobook of the first of the Earthsea novels – A Wizard of Earthsea – read by Harlan Ellison, himself a Hugo, Nebula and Edgar-winner. 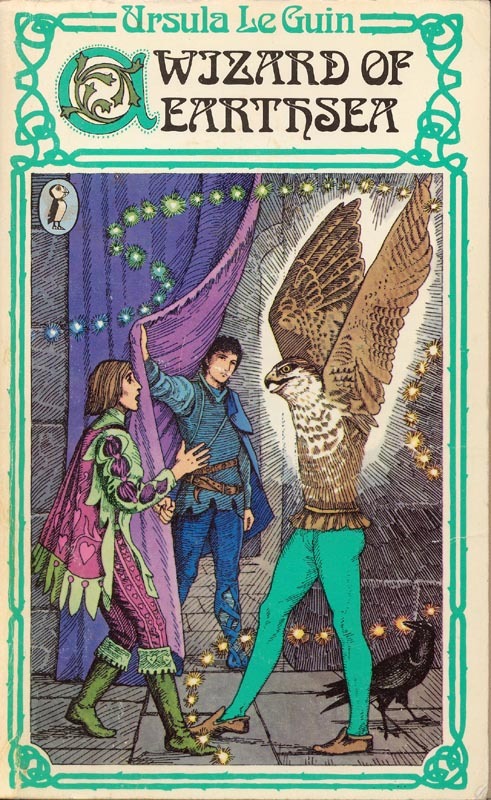 This is the story of Ged, aka Sparrowhawk, a powerful and gifted young wizard who is led by vanity into summoning to his world a shadow-evil set on possessing him. After realising his mistake, he at first tries to run from it, but after some adventures and much growing up, Ged decides to pursue and confront his biggest fear. To support her tale, Ursula Le Guin developed a complex world of islands and a philosophy behind the magic in it: in order to have power over people and things, wizards must know their “true name”. This recognition of the power of words was my favourite part of the book. It reminded me of Orwell’s Newspeak – if people don’t have a word for freedom, will the concept even exist? If you dumb-down the language, are you also dumbing those who use it? These questions always fascinated me. Words and language are potent stuff and this is what I took from Earthsea, more than the redemption and coming of age themes. I cannot escape the feeling that I would have enjoyed this book much more if I was a 12-year-old boy. I kept wishing for her to go deeper into Ged’s personality and show, not tell us, about his evolution. On the audiobook itself, Harlan Ellison reads if he’s reading poetry and sometimes at the end of a particularly enthusiastic sentence you feel like shouting AMEN!, as if he’s preaching from the pulpit. I’m still of two minds if I liked his reading or not and how much it influenced my impression of the book. This is my first fantasy on audio and I missed the map at the beginning of the book as well as actually seeing the magical words written in different Earthsea languages. In the end, I’m interested enough to read the sequels, but I’m also hoping for a bit more character development and hoping for a strong female in the near future.